A review in 10 words (or therabouts): Drama, drama, drama, music, and learning to live in the spotlight. It's senior year at CPA (Creative Performing Arts) which means senior showcases and increased competition between students vying for a spot in front of important college recruiters. Carter, the child movie star, just wants to be normal for a change. Sophie, the would-be diva, is still waiting for her break out moment. Ethan, the musical genius, is fighting insecurities. And Emme, the composer extraordinaire, is holding them all together. I love stories centered around music, probably because I don't have an ounce of musical ability in my body and I'm completely envious. Eulberg does a fantastic job detailing the competitive nature of specialized schools. The story is told in multiple perspectives which makes it a quick, easy read. The multiple perspectives have a tendency to take away from character development. Why I enjoyed the story (despite the immense amount of high school drama), I never really felt attached to any of the characters. The story was really about Emme, and while it was interesting gaining different perspectives of the story unfolding, you lose some of the emotion that more time on one perspective would have given. Overall, an enjoyable read. 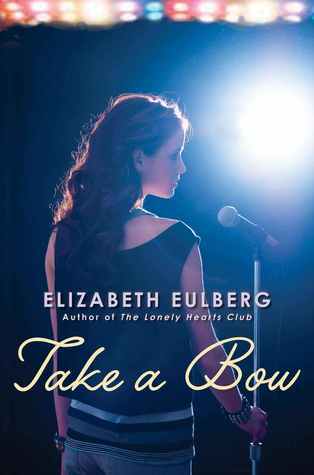 If you're looking for something fun and light...or you love "I love you"..."I hate you"..."I love you"..."I hate you"...then pick up Elizabeth Eulberg's Take a Bow. Similar Titles: Prom and Prejudice by Elizabeth Eulberg, The Boyfriend List by E. Lockhart.